Introducing Tantra with Evalena Rose, M.A. Discover how ancient arts of Tantra can enhance your capacity for intimacy and conscious sensuality. Open to your full sexual aliveness! ​We explore Tantra in an environment of boundaries and respect. People leave happy and more at peace. Many people repeat these amazing evenings for the joy of connecting heart-to-heart & soul-to-soul. "I love experiencing the aliveness and vitality of being truly present when intimate. Evalena skillfully helps you move past the fear and vulnerability of being authentic." 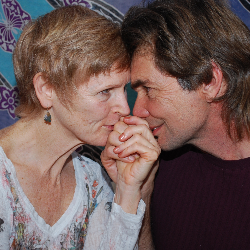 "Of the many tantra teachers I've known, Evalena creates the safest space and moves along at a gentle pace. She encourages each of us to honor ourselves and tell our truth and helped us do that when we didn't know how. I highly recommend her."